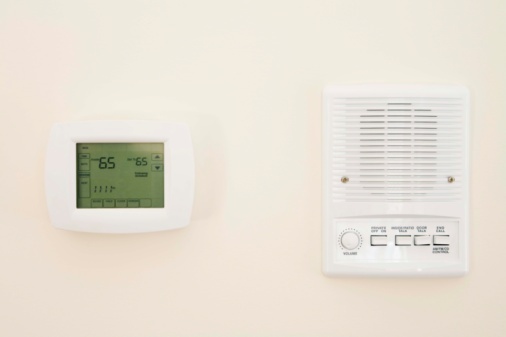 When the weather is hot, a programmable thermostat will keep your home cool, and when it gets cold outside, the thermostat will keep things nice and warm. One option for maintaining your preferred temperature is a Lux 1500 electronic thermostat. Its thermometer detects the temperature in your home, and according to how you set it, the Lux 1500 will turn on the air conditioning or the furnace until the house reaches the temperature you desire. After you program it, you might decide to lock the thermostat so no one can tamper with the settings. You can easily unlock it to make new changes. Press and release the "Next" button, in the center of the thermostat's programming panel, three times. Press the "Hold" button, and then release it. The thermostat is unlocked. You can now press the "Up" and "Down" buttons on the panel to change the temperature settings, temporarily overriding the programming. "Override" will appear in the display. The override feature will automatically cancel when the next programming period begins. Press and release the "Next" button three times, and then press and release the "Hold" button to lock the thermostat again. How Do I Unlock Trane Thermostats? Can Aluminum Foil Reflect Heat From Windows?